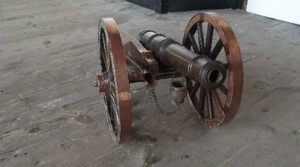 The cannon was first invented in China, and is one of the original gunpowder operated weapons. The first record of cannon use is said to have been from the Battle of AinJalut between the Maluks and Mongols in 1260, while the first cannon in Europe was used slightly later between the 11th and 12th centuries in Iberia. This weapon then arrived in England in the Hundred Years’ War at the Battle of Crecy in 1346. Over the years, cannons became more and more advanced (and destructive). They were used widely over the centuries and played a key role in World War II, though in the second half of the 21st century they’ve been rendered all but obsolete in most parts of the world, being replaced by higher impact weapons like missiles and bombs. Today, the primary function of most cannons—at least in North America—is for ceremonial, display, and collectible reasons. Indeed, “cannon collecting” has become quite a trend, and we’ve rounded up just a few of these antique weapons that are available for purchase! 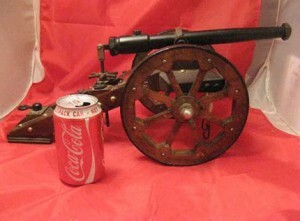 This antique replica gun is a perfect way to start your collection. 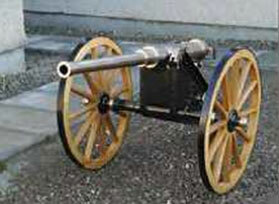 Small but mighty, this cannon has no makers marks on it, though its detail and construction is almost flawless. It’s also classified as antique/obsolete and therefore requires no license, and since it’s so compact, you don’t have to worry about not having a whole room dedicated to your cannon collection…yet! Once you’re ready to size up, you might be interested in this 19th Century Victorian Cannon, or something similar. It’s twice as big, and boasts oak and copper details, a carriage fitted with a scoop and bronze ram rod, and a firing-ready barrel made from gun metal. 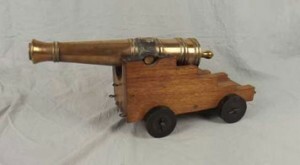 Don’t underestimate this highly collectible GR III bronze signaling cannon because of its size. Only 18.5 inches in length, this cannon is a true antique, and was built over 200 years ago. It has since been deactivated, but it’s still a sight to see and a great addition to any collection with a long four ring barrel, bearing the GR III cast on a matted ground by the trunnions. Now this is one cannon for the serious collector. This fully functional field cannon features an interrupted thread system that locks and unlocks with 60 degree rotations, and its quality is reflected in its details. With English oak and ash wheels made by Mick Rowland (wheelwright to the Queen Elizabeth), its barrels were proofed by Birmingham proof house and can handle a 2 lb shot driven by 1/4 lb of black powder. If you’re still unfamiliar with cannons, that’s a lot of power!